Our liquid yeast selection from White Labs offers home brewers an some truly unique strains that you just can't find with dry yeast. 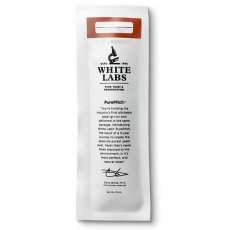 Expand your brewing horizons today with some White Labs yeast! A classic English strain that is highly flocculant, creating incredibly clear beers. Now available in the PurePitch packaging! A blend of a German weizen yeast and a culture of Lactobacillus. Makes light and refreshing beers with lactic sourness. Perfect for Berliner Weisse beers, but can also make for other interesting sour styles of beer. A powerful yeast with an alcohol tolerance of 25%! A saccharomyces strain of yeast that is similar in character to brettanomyces. Makes incredibly fruity, funky beers that are well-attenuated. Good for a range of beer styles where fruity and funky characteristics are desired. A southern German lager yeast strain from White Labs. Produces clean lager beers and can help accentuate malt complexity, with good clearing properties. Perfect for malty lagers beers. A classic German lager yeast strain from White Labs, the most popular lager yeast in the world. Produces beers with a malty yet clean profile. Very versatile, perfect for almost any lager style beer. A classic Oktoberfest/Marzen yeast strain from White Labs. Produces beers with a distinct malty sweetness that are rich and delicious. Perfect for a wide range of malty lager styles. A clean-fermenting California Common yeast strain from White Labs. Produces clean, lager-like beers even up to 65F. Perfect for a wide range of styles, and for brewers who want to make lagers without precise temperature control. A dry and crisp Lager strain of yeast. Produces dry lagers with very little diacetyl. Perfect for a wide range of lager style beers. A wonderful strain for use in the production of classic pilsners. Produces a clean, crisp and clear beer with a bit of dryness. A great yeast strain for Pilsners, but can also be used in the production of a wide range of lager beers. A great strain for use in the production of unparalleled Belgian strong ales. Produces both spicy phenolics and citrusy ester compounds, leaving the beer complex and crisp. A great yeast strain for Belgian golden strong ales, but can also be used for Belgian dark strong ales, Belgian blondes, Belgian wits, singles, dubbels, tripels, Belgian table biers, and Biere de Gardes. A great, fruity and less fussy Belgian Saison yeast strain. Generally produces more fruity esters than spicy phenolic compounds. A great yeast strain for Belgian Saisons, Belgian blondes, Belgian wits, singles, dubbels, tripels, golden strong ales, dark strong ales, Belgian table biers, and Biere de Gardes.